The amount of cash multinational corporations are stashing is at an all time high and economists are wondering why. A recent Federal Reserve research paper examined some of the reasons. A big one is multinationals pay no taxes on profits if they park them offshore. A stash of cash is building and the miser pile is now a mountain. A large study released early last year showed corporate taxes are at a 60 year low. Multinationals park huge amounts of cash offshore, all to avoid paying taxes on these vast sums if brought to the United States, at least that's the claim. The official corporate nominal tax rate is 35%, but multinational corporations never pay that and they would not pay 35% if they repatriated those offshore held hoards of cash back into the United States. Federal Reserve economists Sánchez & Yurdagul tell us corporations were sitting on over $5 trillion in cash and short term investments during 2011. The last flow of funds report also shows corporate cash, otherwise known as liquid assets, at an all time high, $1.925 trillion in the 3rd quarter of 2013. 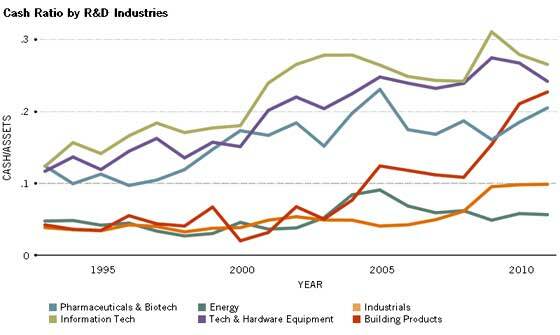 In two sub-indexes within the S&P 500 corresponding to two R&D-intensive sectors, cash holdings increased at a high yearly rate between 1995 and 2011: by 15 percent for the pharmaceutical sector and by 11 percent for the information technology sector. In the former sector, some firms had an annual increase as high as 26 percent. Within the latter sector, the top firms had increases between 16 and 22 percent in cash holdings in the same interval. We suspect a much stronger correlation to the above cash mountain R&D graph, outsourcing. This is key, for much of research and development that was done inside the United States has been offshore outsourced by multinational corporations. These companies offshore outsource extensively. Additionally companies which make building products recently ramped up their offshore manufacturing. What the Fed researchers label R&D focused companies, are actually the very multinational corporations who have lead the charge to offshore outsource American jobs. Notice how I.T., technology and pharmaceuticals are at the top of the cash hoarding list in the above graph. All of these sectors have notoriously shipped jobs overseas in droves. The most recent BEA data on multinational corporations gives more evidence offshore outsourcing of R&D is the cash hoarding culprit. 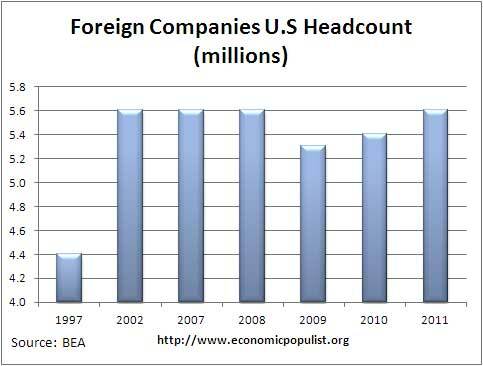 In 2011, multinationals once again increased their employees outside the United States while not hiring inside the United States. 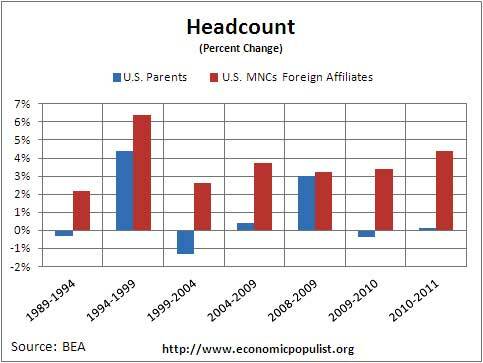 They increased U.S. headcount by only 0.1% while increasing their staff abroad by 4.4%. The below graph shows 2011 isn't an anomaly. U.S. multinational corporations have been moving jobs offshore and creating jobs offshore for quite some time. 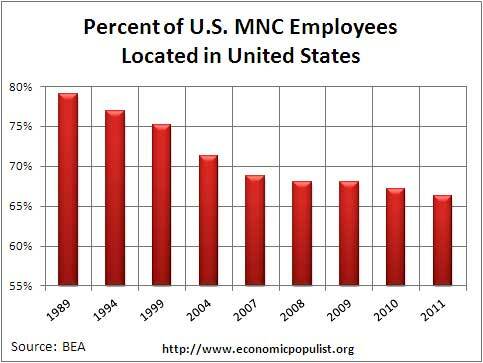 U.S. multinationals managed to reduce their United States employees by 0.9% in just a single year. In 2011 only 66.3% of their total staff was located inside the United States. In 1989, that figure was 79%. The below graph shows how U.S. corporations are expanding their hiring abroad while flatlining the U.S. 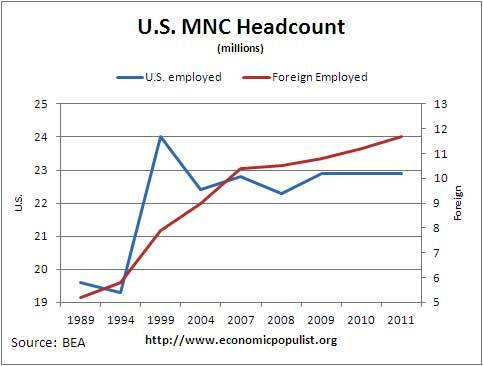 Meanwhile foreign companies operating in the United States are employing more people here. They increased their U.S. employment by 3.3% in 2011. The increased hiring by foreign companies is literally dismissed due to new U.S. acquisitions in the BEA report. The thing is, U.S. multinationals acquire new companies and thus new staff all of the time and the results are often unfortunate, mass downsizing and firings. Apologists will argue that U.S. multinationals are simply hiring where their sales are and abroad is where expansion is happening. 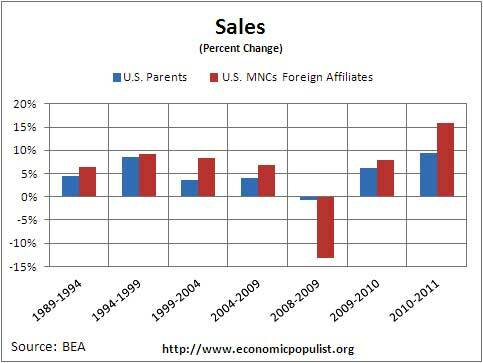 They point to the percentage change in sales made abroad vs. in the United States as shown in the below graph. In 2011 sales in foreign lands increased 15.8% whereas U.S.sales increased 9.4%. The first thing to notice is how sales dramatically increased while America had an employment crisis and eroding wages. The real kicker is the next graph. The majority of sales are still in the United States. In 2011, these multinationals had sales in America worth $10.7 trillion while their foreign country sales were almost half that, $5.9 trillion. This means these companies are obviously offshore outsourcing for sales ratios are not proportionate to their disappearing U.S. staff. Foreign companies' sales on the other hand, statewide increased 11.9% in 2011, 6.9% in 2010. In other words, on the whole foreign companies are hiring more proportionately to their U.S. sales inside the country. Another telling sign workers are being labor arbitraged by U.S. multinationals is capital expenditures. 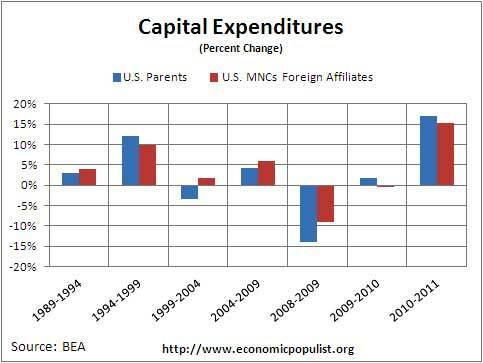 U.S. multinationals have more capital expenditures domestically than abroad. In 2011 capital expenditures state-side were $514.5 billion whereas foreign capital spending was $192.0 billion. The thing is, one can buy equipment, fleets of automobiles in the United States, turn around to lease and ship them to their foreign affiliates abroad. Again some of this buy here, lease there, license elsewhere, is for profit shifting. Multnationals obtain tax write offs in high tax nations, and use land-lease international manipulations, again, all to avoid taxes. Foreign companies operating in the United States on the other hand, increased their U.S. capital expenditures by 12.3% in 2011. Economist Bruce Bartlett also shows how companies force sales in tax havens, all to avoid hiring American workers and pay U.S. taxes, which reinforces the statistics outlined above. The major role of R.&D. in large cash holdings may reflect the greater opportunities for tax avoidance among businesses that can easily transfer intangible property abroad without having to move production operations or jobs to other countries. It is a simple matter for companies holding patents, copyrights or trademarks to transfer them to foreign subsidiaries and realize the profits accruing to them in lower-taxed jurisdictions. I had an experience with this phenomenon just recently. I needed a copy of Microsoft Word for a new computer and went to www.microsoft.com to buy it. But when I tried to pay for it, my credit card was rejected. When I checked with my credit-card company I was told that the charge appeared suspicious because it went to a company based in Luxembourg – a well-known tax haven. This technique is used by many technology-based companies. For example, The Wall Street Journal reported on Feb. 7 that the patent for the hepatitis C medication produced by California-based Gilead Sciences is domiciled in Ireland, another common tax haven. The home company thus pays royalties to its Irish subsidiary on sales of the drug in the United States, transferring profits from the United States to Ireland. The role of taxes is challenged in a recent working paper by economists Lee Pinkowitz, René Stulz and Rohan Williamson. They compared firms with headquarters in different countries. After controlling for characteristics of the firms (sector, size, etc. ), they showed that U.S. firms were holding more assets in the form of cash than were foreign firms. Then, they focused on the characteristics of other countries that may potentially lead to such differences. They concluded that differences in the way that countries tax foreign income do not alter the cash-holding behavior of the firms. 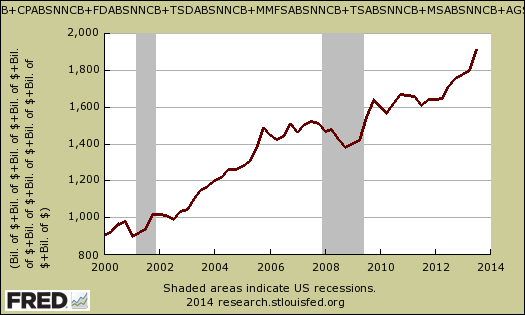 The thing so astounding is America to this day has an employment crisis. Yet giving U.S. multinationals a tax holiday for using money parked offshore to hire U.S. citizens just never seems to come up as a common sense policy. Imagine the economic boost trillions of dollars would give to the real economy if these funds were tied directly to U.S. citizen employment. If one could create not just zero taxes on funds repatriated for this purpose, but a tax rebate for retaining and training U.S. citizens long term, it would set the U.S. economy on fire. Yet doing something for America's middle class and highly educated work force never seems to come up as a solution. Even mentioning the fact corporations have a responsibility to provide meaningful employment to the citizens of the nation they reside is somehow taboo. 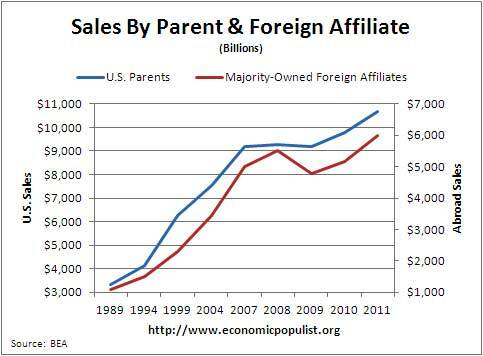 Isn't that odd with such damning statistics U.S. multinationals are economically hollowing out the nation? Why would any political persuasion object to tax breaks, rebates and cash repatriation in order to bring this nation back to full employment and a humming economy pronto? It is almost as if our own government and powers be hate Americans, for at all costs they will not give us a common sense and practical break. Great rant on "Morning Joe"
This morning on MSNBC's "Morning Joe", host Joe Scarboroug blasted the tax code and how the ultra-rich paid so little in taxes—calling it "obscene". And he also railed against their offshore banks accounts to dodge taxes, saying, "If they want to keep their money offshore, then they should move offshore too. We don't want you here." A way to swing the game in the favor of the working American is to stop the export of raw materials to foreign nations. The natural resources belong to the people of this country. If a foreign country wants steel, let them buy "junk cars" for example. When this country is out of natural resources, we will be out of business. If China wants American Steel to build cars, no problem build the cars here. Our natural resources should be used to employ people here in the U.S. .
A little later on in the program the MSNBC hosts had Bill Gates on as a guest, to discuss his 2014 annual letter. They asked Gates about the new wealth report, showing the world's top one percent had 50% of the world's wealth. But rather than waiting for a definitive answer, they asked him about raising the minimum wage, and Gates was lukewarm on the subject, saying raising the minimum wage would cause wage substitutions, and that the issue was "complicated", and that a lot more thinking was needed on the idea. None of the MSNBC hosts had asked Bill Gates about the low tax rates on the top one percent or about offshoring jobs—they just mostly showered the multi-billionaire with platitudes for all the good work his foundation does to fight poverty (in other countries). This is more CEO worship that because he is one of the richest people in the world, somehow that gives him knowledge and wisdom above the rest. He built Microsoft with shady dealings, stole code and was in the right place at the right time. That does not make him a good social engineer or even good at basic economics. It makes him have a big fat feather in his cap for building the most dominant software company in the 1990's, EOM, that's it. Also, raising the minimum wage does not cause substitutions. The minimum wage has been one of those great economics "war" topics, but the statistics show it doesn't cause less employment or substitutions in effect to date. Go with the historical data on it. There are pluses and minuses that seem to cancel each other out to go to the overall economic positive. NYTimes and the DNC say unemployment is a good thing, thanks to Obamacare. So, these long term unemployed should be happy! They're "free" of the burdens of the rat race. They get to tuck their (hungry) kids in at night. And, on the 1st and the 15th, they get their checks for doing... NOTHING. You cannot have it both ways. You cannot condemn companies for hoarding cash to weather the storm we all see coming and not hiring people, and turn around and say, "6% unemployment! Better than 5 years ago! And Obamacare will free people from having to work! Weeee!" This is simply fiction and may I suggest, "there for the grace of God go I" when contemplating the dire and desperate financial situation most people in America find themselves in. May I remind you that we've had five years of Mr. Obama's fantastic financial policies, two of those years he had a fully Democrat-controlled Congress. No American should "find themselves" in any dire or desperate financial situation - not according to the unemployment numbers, not according to the trillions of dollars of stimulus spending, not according to the NYT and the DNC. To say that any American isn't leading the most ideal life after all this time of Progressive fiscal meddling is to admit utter failure. We're an economics site and you will read many articles on this site ripping to shreds legislation and policies from both political parties. The site is non-partisan. One would have to be to think anything about what has happened has anything to do with Progressivism from Corporate-Obama. These policies are nothing but Ronald Reagan leftovers. I work for one of the poster children for outsourcing. This company was first cornered on TV by 60 minutes for outsourcing to India. My org chart shows roughly 25 people in the U.S. and 43 in India. The budget for this is really large -- by the way, I haven't had a raise in over seven years. The issue I have is quality. For most of the remote work, it takes at least one U.S. based engineer to clean up after the outsourced person. In some cases it takes three or four, depending upon the complexity. This means that product quality also suffers from outsourcing, not just the U.S. employment levels. The latest is that all our hiring is restricted to "engineers in the beginning of their careers". It doesn't take a genius to figure out what is happening there. The pool of talent is aging (and their experience is also aging) and there is a desire to replace them with younger, cheaper bodies -- now where would those come from? Don't think "recent U.S. graduates", think H1B1 visas. Solution is simple. Make the USA open border. Think about it. The Corps couldn't play labor group off of one another. You put together ipads? You'll be paid the same everywhere. The status quo will never admit this inconvenient truth of how they herd labor. They'll scream nationallism, terrorism and act like jobs will be stolen, when they are stealing (outsourcing ) them now! That's not what happens. It is the opposite. One would get a massive flood of labor and turn the U.S. into a 50%+ unemployment rate. Outsourcing and immigration are about the same thing. It doesn't matter where the worker is sitting, that's a job not going to a U.S. citizen worker. Look at the reunification of Germany and what that did to their economy for over a decade. Generally speaking the labor economics, national economies (economies are buiit on nation-states), is much more complex, but what would seem the intuitive thing, the humane thing is actually the inhumane thing in this case.